In view of the fact that this excerpt summarizes the main information the paper provides excellently, I am not going to ruminate Brad's & Bret's overview of the few studies that allow for relevant and at least to some extend reliable conclusions about the real-world effects of the pump and its significance for someone whose main interest is in building size, not strength (just read the review, if you want the details). Don't worry, it's not as if Brad and Bret had overlooked the latest paper M.S Kristiansen and his colleagues from the Institute of Sports Medicine, the Section of Sports Science at the Universities of Copenhagen and Aarhus. Rather than that, the paper with the intriguing title "Concomitant changes in cross-sectional area and water content inskeletal muscle after resistance exercise" had (a) not even been published, when they the two were doing the research for their review and is (b) as we are going to see not 100% relevant to the question, whether the pump does or doesn't promote muscle growth. 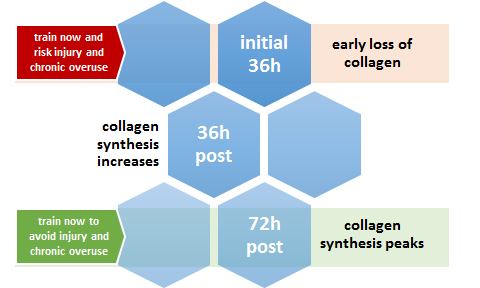 Collagen loss and (super-)compensation occur in the early and late phase of the post-exercise period. If you don't want to risk injury or chronic overuse, you better remember this whenever you're working on a new workout schedule. Does exercise also influence the water content of the tendons? In contrast to its effects on the intra-muscular water content the 3-EX regimen in the study at hand lead to "a decrease in the CSA of the central part of the PT [patella tendon]" within the first 52 h post exercise. "A concomitant increase in the water content of the tendon could not be demonstrated, though." (Kristiansen. 2013). Based on the absence of an overall decrease in water content, Kristiansen et al. speculate that previously observed decreases in tendon size (Miller. 2005; Tardioli. 2012) could have been brought up by a net loss of collagen during the early restructuring processes after heavy workouts. Since the rate of collagen synthesis is negligible within the first 36h after exercise "the breakdown of the tissue driven by catabolic processes [...] may exceed the synthesis" that peaks after 72 h, "if multiple training sessions are too close to one another" (Kristiansen. 2013). The consequences? Acute injuries and / or chronic overuse. Now you may be asking yourselves why the results Kristiansen et al. are about to present in one of the upcoming issues of the Scandinavian Journal of Medicine & Science in Sport still made it into the SuppVersity News, if they don't provide any new insights into the contribution of the pump to skeletal muscle hypertrophy. The answer is simple: They do tell us something that puts a huge "?" behind the results of a whole host of studies on skeletal muscle hypertrophy. Something the average "disco pumper", i.e. a person who works out a couple of hours before he hits the Saturday night life to make sure that his muscles are big and full, knew for years: Your muscle size remains significantly elevated for hours even after comparatively low volume workouts. In view of the fact that few researchers have hitherto exercised the said "necessary caution", it appears to be more or less certain that a non-negligible proportion of the currently available data on skeletal muscle hypertrophy in training noobs such as Kristiansen et al. 's ten healthy untrained study participants would have to be revised or at least tested. ... would probably have different effects in trained and highly trained individuals. Data form one of the few studies with "non-rookie" (aka "recreationally active") subjects does therefore have a much lower chance of having a measuring bias than data from studies with strength training novices. For those, the results of the Kristiansen study could mean that the real-world hypertrophy effects have been largely overestimated. Not convinced? Well, you cannot tell me that you actually believe that a single leg workout will increase the actual muscle size in the "teardrop zone" of the quads (see anatomical chart at the top in figure 2) of any trainee - rookie or not - by 16%, right (see figure 1)? 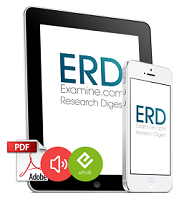 I see no one is shaking his / her head.... well, then what do you think: How many researchers waited for a 3 full days or better a whole week after the last workout before they sent their subjects to the magnetic resonance imaging (MRI) device to obtain axial scans such as the one in Figure 2? I have to admit that I haven't been paying much attention to the time-lag between the last workout and the MRI or measuring tape "powered" assessment of the post-intervention muscle circumference, but I am still convinced that it will be very difficult to find any study, where the post-values were taken more than 54h after the workout. We must not forget, though that (1) the cellular hydration state is among the fundamental determinants of protein catabolism in health and disease (Häussinger. 1993), that (2) Basco et al. were able to show that the AQP4-dependent water transport into the muscle supports both, muscle contractile activity and metabolic changes that occur in fast-twitch skeletal muscle during prolonged exercise (Basco. 2013), and that (3) Brad & Brent's review clearly suggests that the exercise induced cell swelling has a facilitative role in skeletal muscle hypertrophy. Bottom line: If we also take into account that the vast majority of studies will use the 10cm point (see figure 2, left) to quantify the increase in muscle size, it is well possible that the average resistance training study could have overestimated the hypertrophy effect of the corresponding training (and supplementation!) 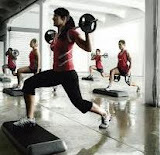 regimen in novice or "recreationally trained" study participants. In view of the fact, that very few of the studies had a duration of only three training sessions (1-2 weeks) and against the background that the multiple training sessions in studies with durations of 2-12 weeks will accustom the muscle to the previously novel stimulus, I would yet not go so far as to say that the results of the average study could be up to 10% off... I do, on the other hand, have my doubts that all the hitherto reported increases in muscle size would retain a p-value of p < 0.05 and would thus have to be considered as "statistically significant", if the CSA measurements had been taken 7days+ after the last training session. Basco, D., Blaauw, B., Pisani, F., Sparaneo, A., Nicchia, G. P., Mola, M. G., ... & Frigeri, A. (2013). AQP4-Dependent Water Transport Plays a Functional Role in Exercise-Induced Skeletal Muscle Adaptations. PloS one, 8(3), e58712. Miller, B. F., Olesen, J. L., Hansen, M., Døssing, S., Crameri, R. M., Welling, R. J., ... & Rennie, M. J. (2005). Coordinated collagen and muscle protein synthesis in human patella tendon and quadriceps muscle after exercise. The Journal of physiology, 567(3), 1021-1033. Schoenfeld, B. J., & Contreras, B. (2013). The Muscle Pump: Potential Mechanisms and Applications for Enhancing Hypertrophic Adaptations. Strength & Conditioning Journal. Tardioli, A., Malliaras, P., & Maffulli, N. (2012). Immediate and short-term effects of exercise on tendon structure: biochemical, biomechanical and imaging responses. British medical bulletin, 103(1), 169-202.